There doesn't have to be a zombie apocalypse for you to need an emergency radio. This year has been a whirlwind of natural disasters in the United States: out-of-control wildfires in the West, freak electricity-crippling lightning storms in the East, and a massive drought in the Middle. The world has gone insane, people, and we need to be prepared! Anything could happen at any time. 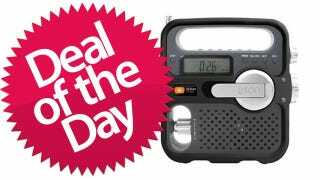 Quick, before the power goes out, buy this $10 Eton American Red Cross Emergency Radio, and tune in to hear news of the apocalypse.